'World's richest terrorist group', the Islamic State in Iraq and the Levant, may have just got even richer, as Iraq teeters on the brink. 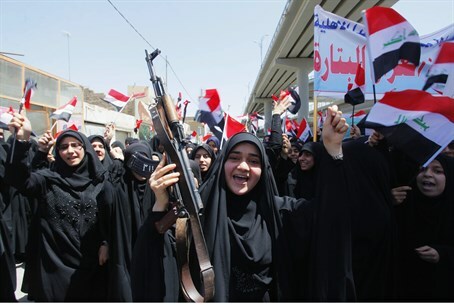 The radical Islamic State in Iraq and the Levant (ISIS) has seized control of Iraq's largest oil refinery, as the Shia-led government makes a desperate push to keep them from the capital Baghdad. An Iraqi official was quoted by Reuters Wednesday morning as saying that 75% of the Baiji refinery was in ISIS hands after the group pounded the complex with mortar and machine gun fire from two sides. ISIS fighters stormed the town of Baiji Wednesday, bringing them closer to the oil-rich city of Kirkuk, seized by Kurdish militias last week in a bid to prevent it from falling to the Islamists. ISIS's calculated conquest of strategically-important and resource-rich territory in both Syria and Iraq has helped fuel its expansionist designs for a mega Islamic state in the Middle East, and gained it the title of the world's richest terrorist group. Meanwhile, embattled Iraqi PM Nouri al-Maliki has made a public appeal for "national unity", as his country rapidly fragments along sectarian lines. Maliki, who is a Shia and close to Iran, appeared alongside Kurdish and Sunni Arab leaders on national TV from Baghdad, even as the Iraqi air force bombed Sunni rebel positions outside the capital. Many Sunni tribesmen and factions have joined ISIS's uprising in the north after accusing the Shia-led government of discriminating against them. Rebels have since pushed southwards, and ISIS has threatened to march on Baghdad after seizing vast swathes of territory in a lightening advance in the past week, prompting both panic and a mass-enlistment of Shia Islamist fighters in support of the government and pushing the country ever-closer to an all-out civil war.